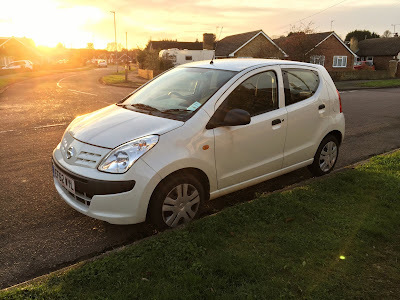 Hullo and welcome to my blog slash column where every now and then I'll post some iterant ramblings about cars, living with my new car and whatever else I have to moan about at the specific time. But first, we must address the elephant in the room. 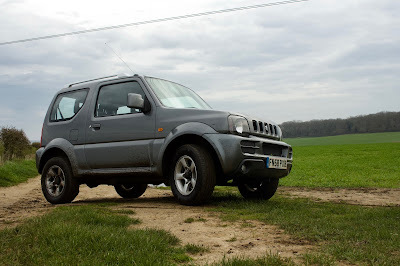 I have sold off my Nissan Pixo and bought in its place a Suzuki Jimny. Simple enough? Probably the best the washing machine on wheels has ever looked. miles back to Reading with the suspension fully compressed. I beat on that thing like it owed me money and never once felt bad about it. I'd rev the nuts off of the tiny one-litre three-banger, dumped the clutch more times than I care to count and ripped the handbrake on in more deserted car parks than a driver with a black box should. The fact that for the 3 years or so that my name was on its V5 it never really had an easy day in its life. For those of you who have never experienced a Nissan Pixo the best way of describing it is that it's like Nissan and Suzuki (who actually built it) sat down and said; "You know what? I think the Micra is too well built, too comfortable, too well equipped and just a bit too nice." and the marketing executives all nodded solemnly and so told the designer to make a car that is about two-thirds of the car the Micra is. Out went electric mirrors, electric windows, any wind-down windows in the back (they simply pop out), air conditioning, a tachometer (one dial will suffice), adjustable headrests, any more than two speakers (but we'll leave the grill for a speaker in the door cards just to remind you how cheap this car is), no split folding rear seat, more blanked off buttons than a minimalist coffee machine, and acres of grey plastic so cheap even Cadbury's wouldn't use it for their Milk Tray. And the CD player eats CDs. Hit any kind of bump (and you'll know when you do) and the CD player will leave a nice scratch on the disc at that exact point. The Pixo was the basic definition of what a car could be if it were a box tick exercise. I soulless white good. It did everything in a way that was acceptable but lacking any panache or flair. German and Japanese cars are often criticised for their unflappability when undertaking a task. But they always have a USP of some kind. A BMW is "the ultimate driving machine", a Mazda has a chassis that feels. The Pixo? Its USP was how cheap it was. It wasn't even overly efficient. It is supposed to achieve around 60 to the gallon. The best I saw was 54 miles to the gallon, and that was driving like a saint wearing glass slippers. Slipstreaming lorries at 56mph means getting anywhere in a reasonable time is difficult. Drive it like you'd drive a normal car at 70mph on the motorway and the tiny engine gets a bit thrashy and the fuel consumption drops. Want to try and keep pace with the big boys in the rightmost lane? Kiss your eardrums goodbye and watch those LCD bars of fuel disappear. However, credit where credit is due, the Pixo did everything I asked of it, even if it was a little stupid to load it past its max capacity or take it off-roading with its minimal ground clearance and skinny tyres. But it had to go. It lacked soul, passion, and the ability to fit a canoe to the top. As a result, in its place on my parent's driveway stands a Suzuki Jimny. Now, my only previous for buying cars is the perilously high mileage Focus wagon I hunted down for my then girlfriend's mother. So I'm not exactly a wheeler-dealer when it comes to these things. Although I did once convince a salesman that the Nissan was worth £4500 and that he could take it and in exchange, I'd get a slightly rusty 1997 Mini Cooper Sport. I am still kicking myself for not doing that because they are going up in value substantially. But that's for another day's moaning. I knew I wanted to replace the Nissan with something vastly more practical and with off-road capabilities. 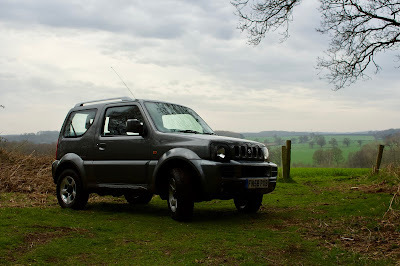 I had looked at Freelanders, dabbled with pick up trucks but I always worked my way back to the Jimny. Last summer I read a story in Top Gear magazine about Jimnys being used in the Tuareg Rally in Morocco. There was something about that 85k mile clunker that chimed with me. Its plucky determination to do what the bigger, actual Dakar trucks do for a fraction of the cost. So for months every morning, my inbox would be graced with an email from AutoTrader telling me of yet another Jimny that had been listed. Eventually, the time came, I had enough free time, the money was in the right place, and I had found one of these diminutive jeeps at a Suzuki dealership in Melton Mowbray. Out in its natural environment; a slightly muddy horse trail in Bedfordshire. After a test drive around the town and a poke about the interior and undersides I was happy this was to be the car for me. Money was transferred, papers were signed and hands were shaken and the deal was done. The next week I drove up in the Pixo and handed in the keys, signed the final piece of paper and took off in the Jimny. And so began the panic that I'd bought a pup. It must have been my initial excitement during the test drive that made me gloss over the fact that the steering wheel wasn't quite straight. But that doesn't seem to be too big an issue, the car tracks straight and true, but it just upsets my inner OCD that the wheel isn't straight, so that's looking like a £40 run to an alignment shop. And as is typical with Jimnys, the kingpin bearings are on their way out which could be a fun weekend in the next few months. Asides from that everything seems A-OK.
Upgrades? There are a few tweaks planned, but we'll see what my bank account can handle. You can follow the life of my new set of wheels on Twitter, @DJJesseB and Instagram, djesseb97. Saturday, 16 June 2018 The Pixo is Dead, Long Live the Jimny - Have I Bought A Pup?